Berry Pomeroy Castle, near Totnes, is widely known as one of the most haunted ruins in England. Its story has been told many times, but here, Totnes author Bob Mann explores the mysterious influence it can have on the mind and imagination. 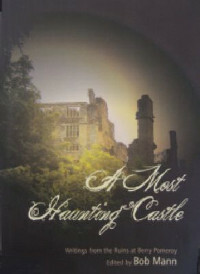 He takes a new look at the ghosts and legends and describes the ways in which writers as diverse as Eden Phillpotts, Elizabeth Goudge and Robert Graves have responded to the castle’s strange spell, before introducing a varied collection of new poems and stories by Helen Ashley, Valerie Belsey, Peter Cowlam, Laurence Green, Deborah Harvey, Sue Hinds, Idris W. Izzard, Anna Lunk, Debbie Miller-Wright, Wendy Ruocco, Pamela Sandry Gorman, Catherine Smith, Ken Taylor, Susan Taylor and Simon Williams. Some authors draw on the traditional tales and legends, others simply take the castle as a starting point for their own creative journeys. All testify to its powerful atmosphere and unique ability to haunt the mind. On a certain mellow afternoon in September, a little over forty years ago, a woman and two children might have been observed alighting from a green Western National omnibus onto the narrow road which winds between thick Devon hedges from Berry Pomeroy to Marldon, at the point where a lane leads off to the left, and a signpost directs the curious traveller to the ancient ruins of Berry Pomeroy Castle. Something must have occurred at that moment: a sympathetic vibration, too tenuous and elusive to be fully apprehended; a strange connection, made or remembered, between the mysterious forces that pervade the environs of the castle and the consciousness of one of the children which has – through chains of causality impossible, with our present knowledge of the universe, to unravel – resulted in the book which you now hold in your hand. I remember it all clearly. It was 1968, and I was about two months short of my tenth birthday. My sister, Fran, was two years younger. I remember the brief walk up the hill, and the group of old stone cottages, at one of which our mother paid for us to go in, and how we entered through the gateway onto the gradually descending wooded drive, and into the dream. Mark Valentine in Wormwood, a magazine of supernatural, fantastic and decadent literature. Abbie Dent, paranormal investigator and presenter of Haunted Devon Radio, Soundart 102.5 FM. Bob Mann truly puts the “I” into literary history. I feel the engagement of one whose ancestors worked the neighbouring lands for hundreds of years. He builds our awareness of the legends with wry analysis. The examination of twists and turns, from history to horror, from myth to mystery, leaves no slab unturned.